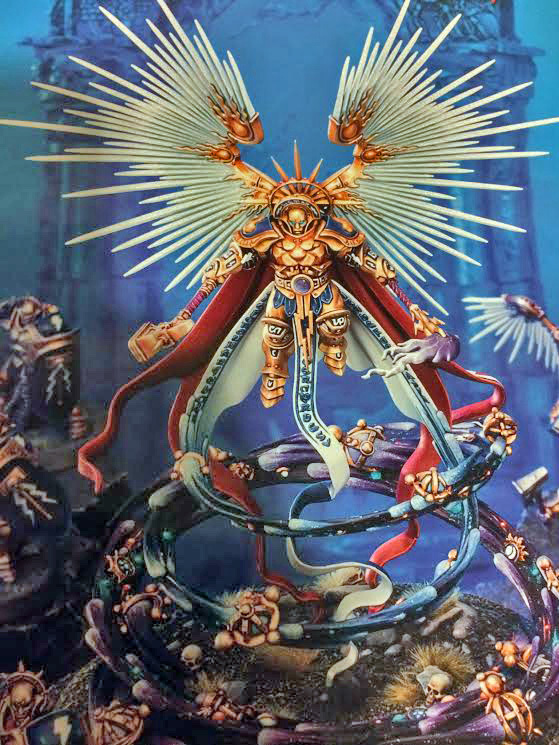 So with the release of sneak peaks of the upcoming Age of Sigmar releases, a new Celestant Prime model was leaked. Can I just say, "BEST SANGUINUS EVER!!" Not the biggest fan of Age of Sigmar, basically more of a 40k aesthetic guy, but I would have no issues clipping the hammer and converting it to a sword or ﻿spear. Throwing on a Sanguinary Guard bare head, repurpose some hi-tech miniatures wings, or pull some bits from eBay from a winged Pegasus or War eagle, etc. Green stuff a more Blood Angel-esque chest piece, and I think we'll have a winner. I will even re-use that hammer head for an Arjac Rockfist conversion too, as I have been looking for a hammer with that design for a few weeks. More to come on that, as I am already assembling the pieces as I write this. Hmmm, now just to find the time to go paint all these projects!